A cached entry is an email address that has been saved by Outlook when you last sent to it. This appears when you begin to type the email address into the "To" field when composing an email. Why might I need to remove it? When using outlook it is possible for cached entries to become corrupt. This is usually caused by a change being made to the destination mailbox, for example the mailbox being moved or deleted and recreated. This will mean that when sending to such a mailbox using a cached entry, it will attempt to deliver the email to the old destination. This will result in a bounce back being generated. 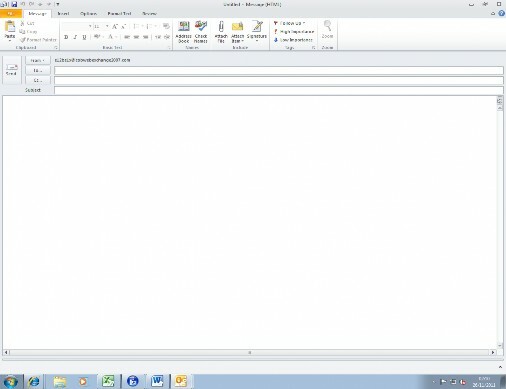 To remove cached entries via outlook the first step is to open up outlook and open a new email. The next step is to begin typing in the email address of the entry you want to delete. This will make it appear with the full, cached, address. When the entry appears select it. It will either be automatically selected or you will need to press the down arrow to locate it. Once the desired entry is highlighted, hit the delete key on your keyboard. You'll notice that the entry has disappeared. The cached entry has now been removed; this means that you will now be able to manually type the address when sending an email.